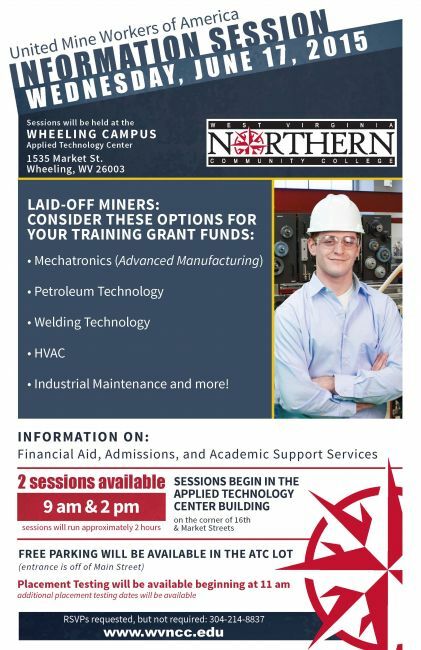 Because of the recent layoffs at area coal mines, and with a goal of stimulating the economy through education, West Virginia Northern Community College is hosting an Information Session for those miners to consider options available for their grant training funds. Two information sessions will be held at 9 a.m. and 2 p.m. Wednesday, June 17, in the Applied Technology Center, 1535 Market St., on the downtown Wheeling campus. Placement testing will be available at 11 a.m. and additional placement testing dates will be announced that day. Free parking is available in the ATC parking lot which is accessed off Main Street. The sessions will be conducted by campus staff and will include academic counseling, financial aid information and assistance, admissions application assistance and academic support services. College officials explained the miners’ training funds may be used for courses at WVNCC. There are many courses at Northern in the fields of gas and oil technology and industrial/mechanical technology that may be useful to the miners. RSVPs are recommended but not required. For more information, call 304-214-8837.